On 26 November, our staff and management organised an open house for our employees, their families and retired employees. It was however no ordinary open house, but also an occasion on which we, as a company, opened our hearts to the less fortunate by turning our family day into a fundraising activity for “De Warmste Week”, which is an event from one of Belgium’s biggest radio stations “Studio Brussel”. By doing this, we also wanted to show our social commitment. As the beneficiary of our action, we chose for St.-Oda (VZW Stijn), an organisation that takes care of disabled people. On 11 December, we symbolically handed over our cheque in the amount of 14.300 EUR to 2 delegates and residents of this organisation. It was a beautiful, successful day thanks to the support of many of our employees, volunteers and sponsors. We would therefore like to thank all these people for their support and for turning this event into such a big success. 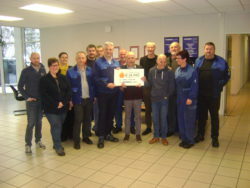 On 23 December, we are going to Wachtebeke by bus together with a bunch of employees to hand over our cheque to the organisation of “De Warmste Week”. It goes without saying that we are very proud of this achievement.